With expert technical support available in-house, Red8RF can respond quickly to any faults or problems you may have with your equipment. We are committed to maintaining your equipment at optimum efficiency thus reducing the risk of process downtime and increasing productivity. 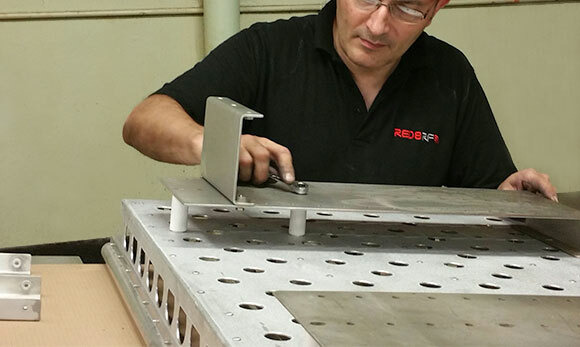 Our engineers are friendly, courteous and have a high degree of expertise and knowledge on the leading Industrial RF Dielectric Heating machines. They can visit your site to assist with any technical issues, advise on the best parts for your equipment and carry out any required pre-commissioning support or installation. They are backed up by a comprehensive stock of spare parts which are available for dispatch to anywhere in the world. Industrial RF dielectric machines have been known to run for decades. To keep older machines in tip-top running condition, we provide a machine ‘Health Check’ where we will review your equipment and make suggestions on how to improve its performance, should you be concerned that it’s not running as well as it could. Whether it is a valve conversion, a new conveyor, a new electrical panel, a new PLC, refurbishing the complete machine or re-commissioning used equipment, Contact Us to discuss how we can provide the expertise.